Duck hunting is a gear-intensive affair most of the time. It just is. And it’s also a great testing ground for equipment, particularly when the weather turns nasty and the ducks that have been loafing around in the land of hockey and maple syrup decide it’s time time to border jump and point their bills toward distant beaches and better weather. This is the time of year when epic hunts can fall into your lap simply because Mother Nature says it’s time, and when that happens you’ll want to be there. You’ll also want to employ the right equipment too so that you can wring the most enjoyment out of each and every sunrise. Following are seven pieces of gear worth any serious duck addict’s consideration. Waterproof TPU material and welded seems make the latest from ALPS a winner in the blind. You can set this sucker down in standing water and rest assured that your shells, cell phone, and whatever else you stow in it, won’t get wet. This blind bag is sized just right for all of the little stuff you need on every duck hunt, and is designed with a litany of interior and exterior pockets, as well as an interior divider so you can keep your gear organized. Some spinning-wing decoys sound as if they’ll rattle apart when you turn them on, but not the Duck Lucky HD from Cabela’s. This ultra realistic decoy is built with a 6-volt rechargeable battery that will operate for up to 16 hours on a full charge. It comes with a remote control that allows you to operate it from your blind, meaning that once you catch sight of a distant flock of greenheads start veering your way, you can turn it on simply by pushing a button. Hunting flooded timber can be an awesome experience, but it can also be fraught with headaches like those that form when trying to attach a typical dog stand to a tree in the dark while standing in waist-deep water. The remedy for this comes your way via Drake, in their Quick-Hitch Retriever Stand, which is designed so that you can attach the receiver to the tree before you attach the platform. It’s simple, but genius. The stand is constructed of solid steel with a black powder-coat finish and a durable, no-snag PVC coated mesh platform. E-collars, like the Master Retriever 1100 from D.T. Systems, are a mainstay in the world of waterfowl hunting. Keeping your dog on the right track is a must, and this is made possible with this collar through its 1100-yard range, 16 intensity levels of Gentle Touch Nick and continuous e-Stim, and its ability to expand to handle two or three dogs. The 1100 is obviously waterproof, comes with a Limited Lifetime Warranty, and is now available in Mossy Oak Shadow Grass Blades camouflage. It’s no secret that LaCrosse makes incredible waders for all of the duck hunting dudes our there, but what about the ladies? In 2018 they’ve addressed the feminine-fowler market with their new Estuary waders, which are chest-high, 3.5mm neoprene options that are built with 1200G Thinsulate Ultra insulation to keep you warm and hunting when the ducks are cold and flying. 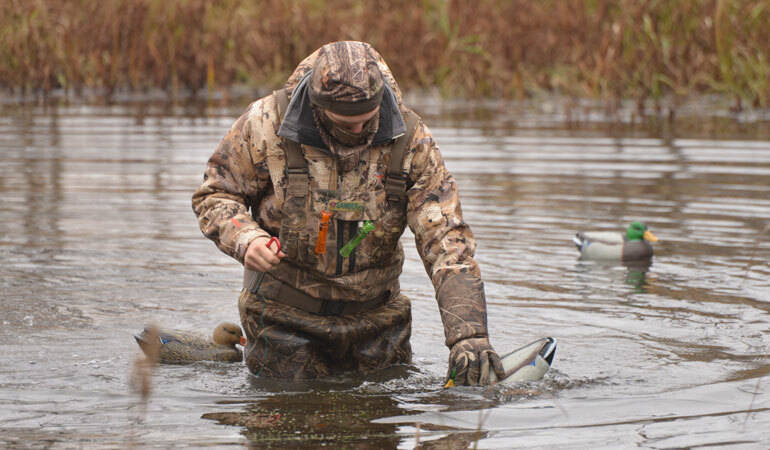 They are also designed with Active Fit, so that they actually, you know, fit correctly, which can’t be said for every pair of waders out there. Through some level of footwear-design magic, the brains behind LaCrosse have kept the weight of the Estuary waders at only 9.5 pounds in total, which is feathery light when compared to similar women’s options. What if your November duck plans involve cut cornfields and hungry waterfowl? Then you need to check out the Field House LP from MoMarsh. This lightweight blind features zippered doors at both ends, a mesh bottom for easy draining and is designed with deployable legs to keep it three inches off of the ground. At only 20” tall, the Field House LP is a true low-profile option for hunters looking to take advantage of field hunting opportunities no matter how pressured the birds might be. Duck dogs are tough, but there is no reason not to offer them a little extra comfort and buoyancy when you can. For this task, it’s tough to beat the Bloodline Elite Dog Vest from Rig’Em Right. The Bloodline boasts three-layer construction to not only keep your dog warm and dry, but also free of any nastiness the brush might throw his way. It’s also designed with an athletic cut to fit your dog correctly, and is available in either GORE OPTIFADE Marsh or Timber camo patterns.